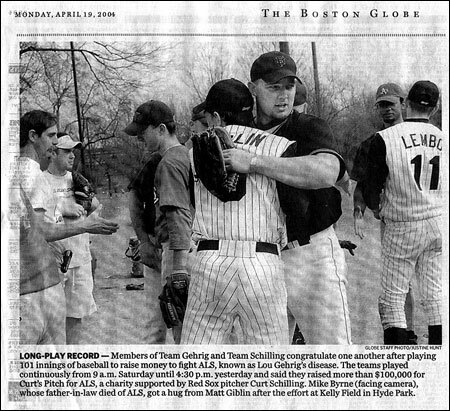 The Boston Men’s Baseball League teamed up with Curt Schilling and The ALS Association, Massachusetts Chapter by holding what is believed to be the longest baseball game ever played in New England — 100 innings — though the game actually went 101 innings. 183 players ultimately suited up and played in the record-breaking game to raise money for Lou Gehrig’s disease at Kelly Field in Hyde Park. The game began Saturday 4/17 at 9:00AM and concluded Sunday 4/18 at 6:00PM — 33 straight hours, nonstop through the night. Curt Schilling of the Boston Red Sox’ wife Shonda was in attendance on Sunday. Shonda went 1 for 1 with a single up the middle, scoring the 95th run in the bottom of the 93rd inning for Team Stamina. 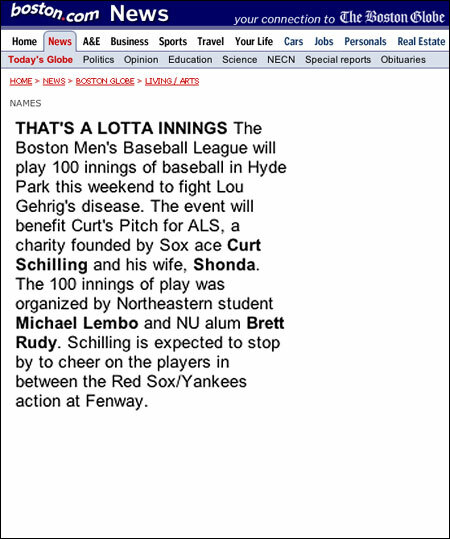 Curt Schilling was unable to attend, as the Red Sox were battling the Yankees all weekend. 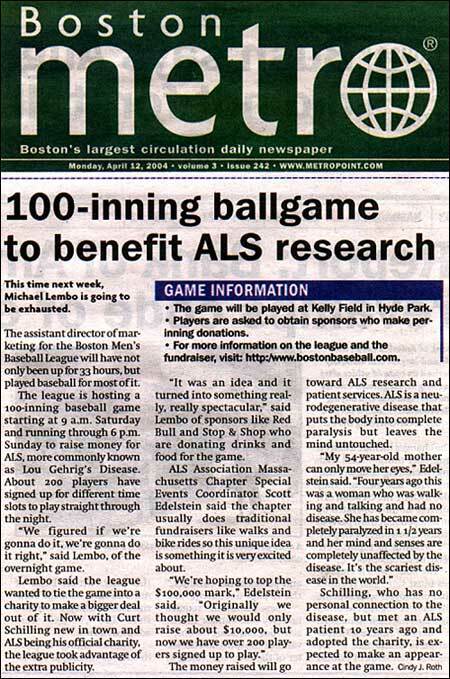 The “Official Check Ceremony” took place April 29th before a game on the field at Fenway Park. Bob Lobel of CBS Sports presents 100 Inning organizers Brett Rudy and Mike Lembo, as well as full-gamer Matt Giblin with an award for their efforts. 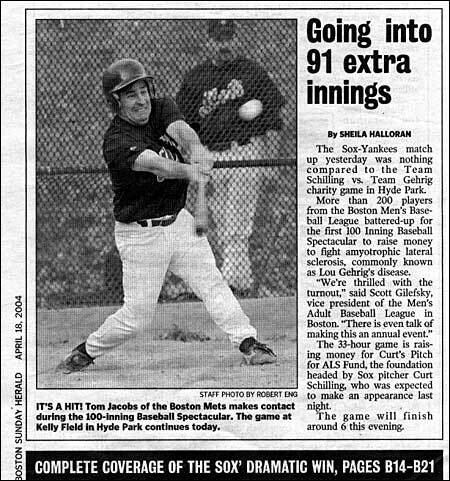 Nine players and one umpire played all 100 innings: Russ Ward, Patrick Seltsam, Matt Giblin, Tyler Walsh, Jeff Roy, Alberto Collando, Kelly McCormick, Neil Sisson, Mike Lembo, Brett Rudy. About $99,035 was donated in cash, check and credit card at the field, with $111,949 raised overall. 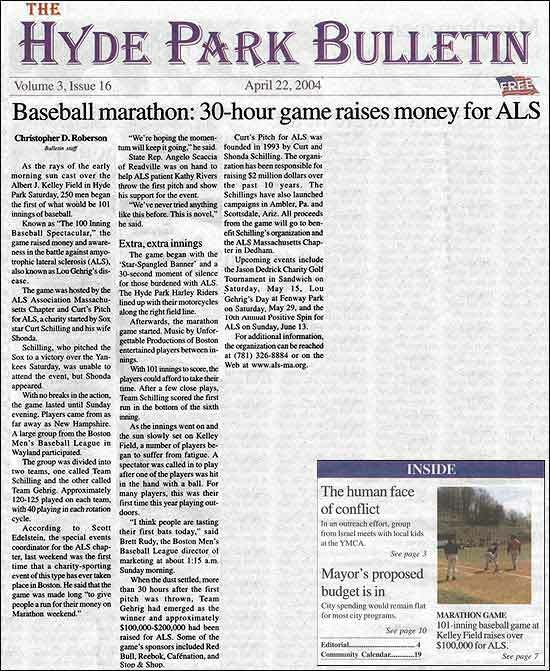 More than 1,615 different sponsors provided pledges to these ballplayers. Ballplayers were primarily from the BMBL, but also came from New Hampshire, Rhode Island, Maine and even Canada to play. 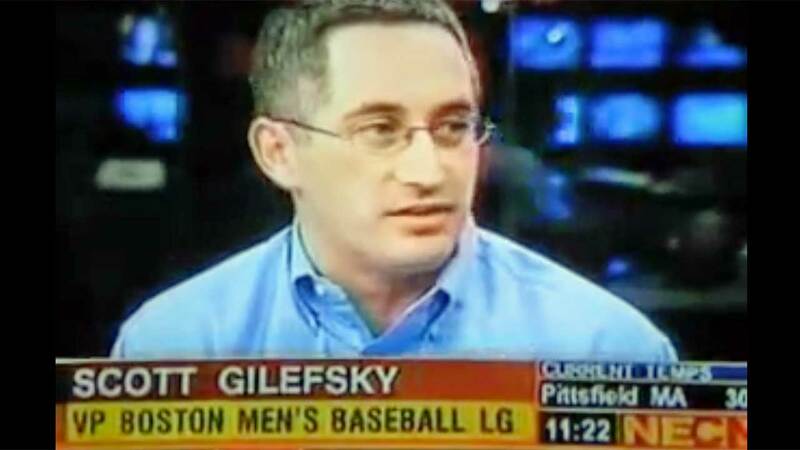 By raising donations, players earned contributions toward their league fees, as well as prizes, such as signed Red Sox jerseys, invitations to a private party held by Curt Schilling, Reebok cleats, Donruss baseball cards, Red Sox Green Monster seats, and much more. Corporate sponsors donated food and drink, and included Stop & Shop, Red Bull and cafenation. Hundreds of other corporate and personal sponsors have made financial contributions. Read about the game. Every stat. 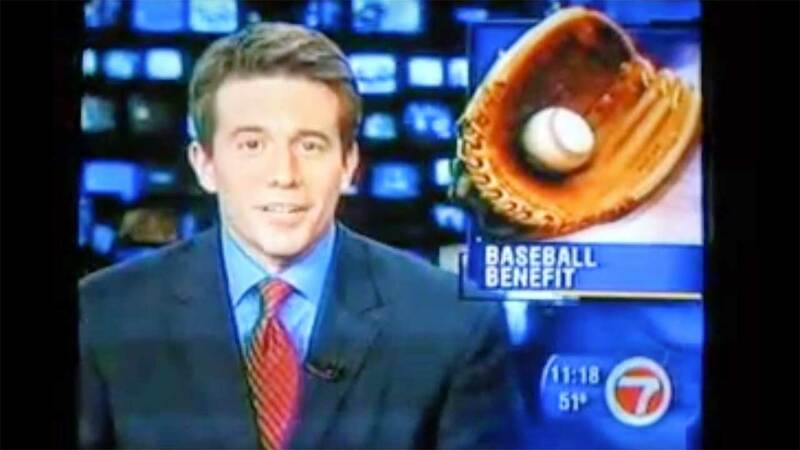 All the coverage. And every donor and dollar raised. * Both sides of the 90th inning were played by the Hyde Park Harley Riders bikers group, as they were large financial supporters of the 100 Innings of Baseball Spectacular. 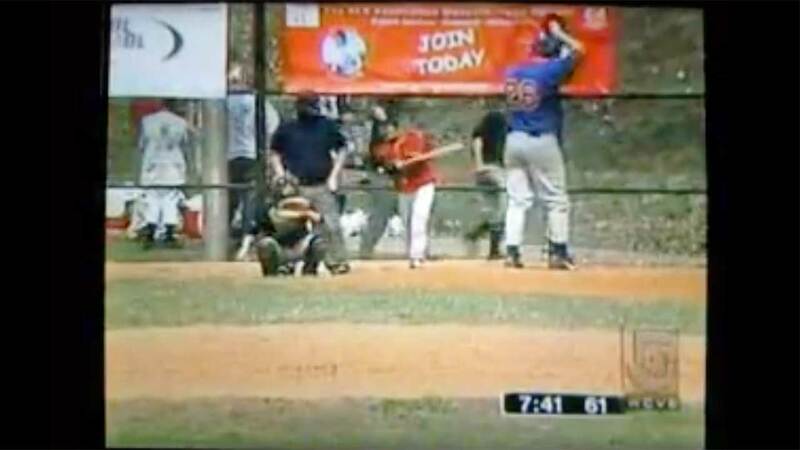 This inning did not count toward the final score. 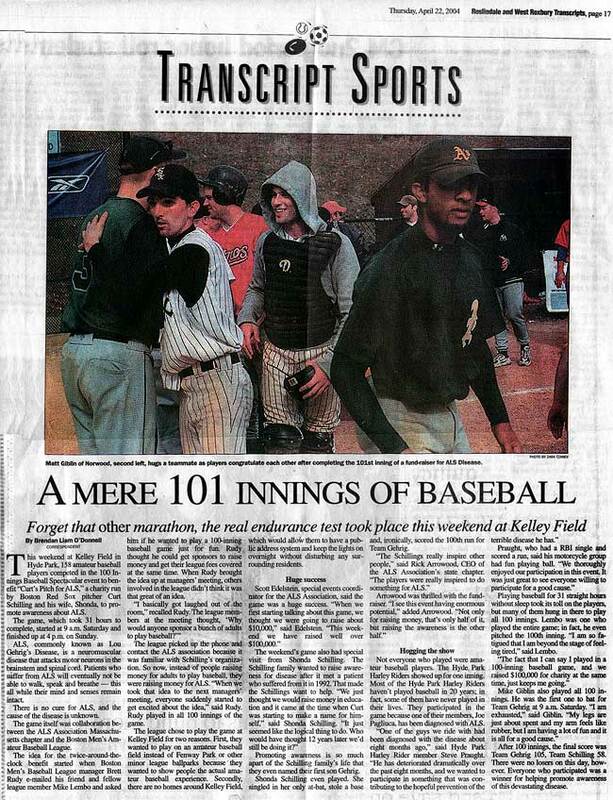 Download the 100 Innings of Baseball Box Score from 2004. 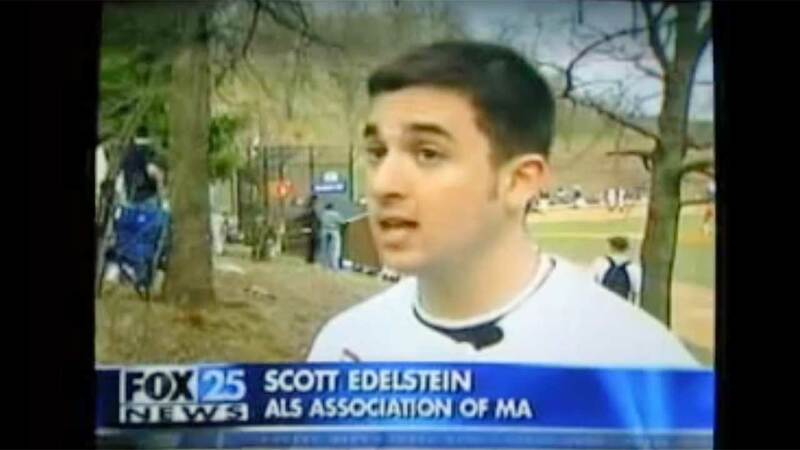 More than 1,600 individuals and businesses made pledges to raise money for The ALS Association Massachusetts Chapter. Together, they raised more than $100,000. It is only fair to thank them all for their generosity.